A well-known restaurant and former nightclub was on fire today, Thursday. 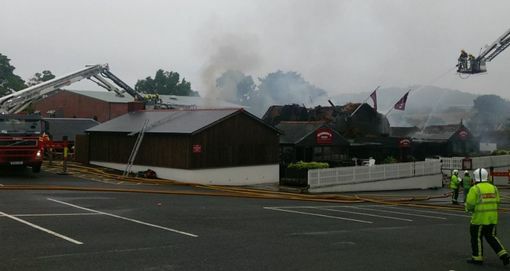 Around 60 firefighters were at the scene of the blaze at Hickory’s Smoke House in Kidderminster Road, Wall Heath . The blaze broke out at around 4am. The venue used to be called the Kingfisher Club and hosted a galaxy of top cabaret stars, including Bob Monkhouse and Frank Carson. Fire crews battle the blaze as smoke fills the sky. Good morning. Welcome to our live updates service as a landmark restaurant catches fire. The blaze broke out at Hickory’s Smoke House at Wall Heath in the Black Country at 4am today, Thursday. Flames could be seen for miles around. Firefighters have been at the scene since 4am. 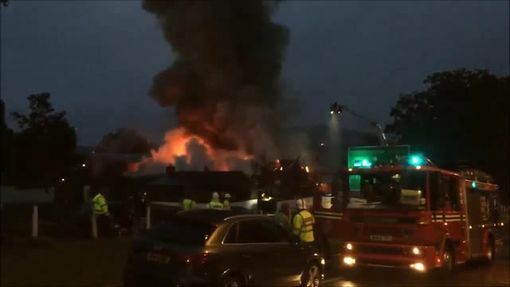 Roads near the scene of the fire in Kidderminster Road were closed and commuters were urged to avoid the area while firefighters tackle the blaze. The main A449 was blocked in both directions and diversions were put in place between Lodge Lane and Swindon Road. The closure affected traffic heading between Stourton and Dudley. 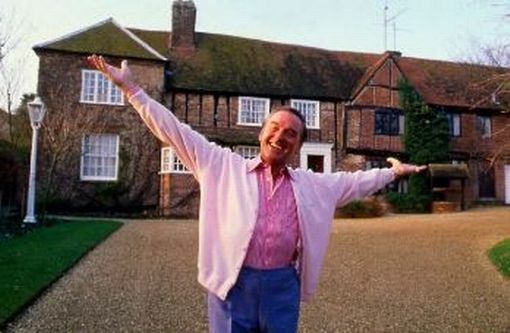 Bob Monkhouse was among the stars to perform at the old Kingfisher Club. The restaurant building was once known as the Kingfisher Club and hosted a galaxy of top cabaret stars, including Bob Monkhouse and Frank Carson. A casino was housed in the club’s cellars. The Kingfisher Country Club itself was built in the 1930s when it was known as the Kingfisher Lido, where it housed the only Olympic sized swimming pool outside of London. Plumes of smoke could be seen from miles around as dawn broke. 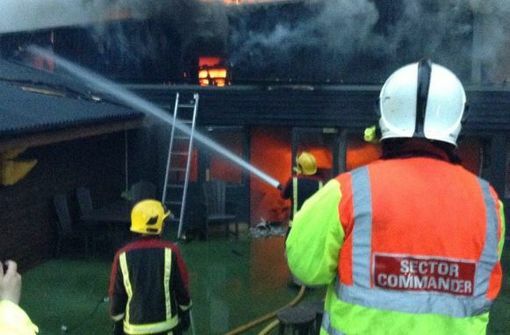 West Midlands Fire Service urged residents to keep their doors and windows closed. Some good news as the restaurant chain which runs the venue confirms no-one was injured in the blaze overnight. Well-deserved credit for the fire service. 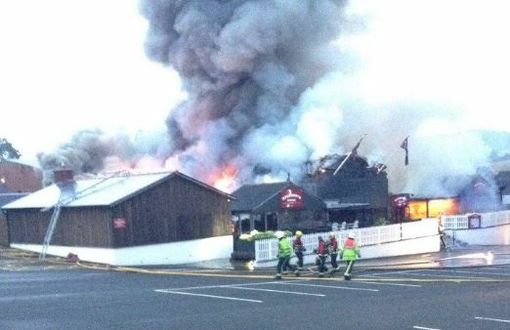 Very sad to wake to the news on @Hickorys_ #wallheath. Please keep clear of the area. We will be offering all the support we can. My view earlier from my bedroom window. 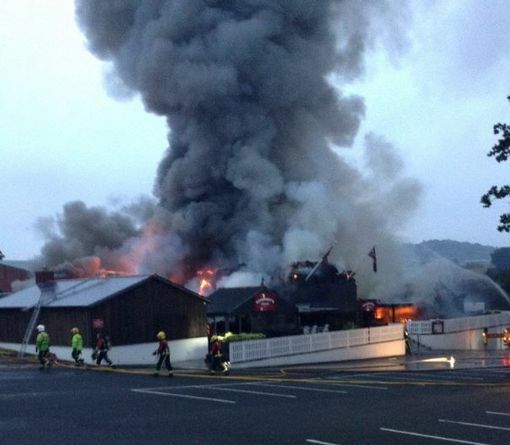 Completely gutted for@Hickorys_ hope they can recover from this!! A huge plume of smoke rises from the Hickory’s Smoke House restaurant. “The fire in Wall Heath and resulting road closure is causing severe delays in the smaller roads in the immediate areas. The A449 High Steet is closed in both directions and traffic is being fed on to Moss Grove, which is practically crawling towards Kingswinford. 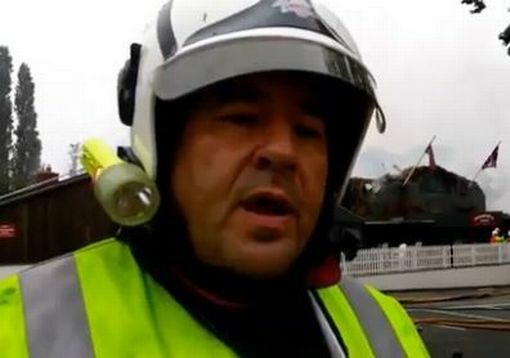 Station Commander Russ Gauden, of Fallings Park Fire Station, has just told our reporter that the blaze took hold in the thatched roof of the historic building quickly and 100 firefighters were deployed to tackle the blaze at its height. “We had a call at 2.32am and were here within five minutes. On arrival we found a fire which had broken through the thatched roof. We committed two firefighters with breathing apparatus Inside the building. We also evacuated the hotel which had 22 rooms, there were no injuries. The fire was quite severe because of the thatched roof. At its height, we had 15 appliances, 100 fire fighters. “It’s still ongoing and we haven’t been able to go in. We are going to be here most of the day and early evening because of the amount of digging out. @Hickorys_ terrible news about wallheath – I had a party booking there for 1st Oct where I had paid £100 deposit how will I get this back? From reporter Jabir Authi: Groups of tired hotel guests are huddled around the far end of the car park of Hickory’s. A hydraulic platform is dousing the smouldering thatched roof of the popular restaurant. Plumes of smoke waft across the site. The fire service have set up supplies and resources to keep them going through the long operation. They are working flat out. 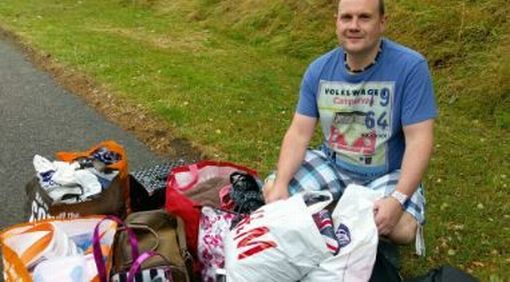 Paul Cliff will all his bags. “We are moving house and our rented accommodation won’t be ready until Monday so we were living in that hotel for six nights. That’s why we have more stuff than usual. We were watching a film and had just dozed off when the fire alarm went off. We grabbed a key and phone and ran out. We could smell the smoke and the guy on reception said the restaurant was on fire. When we stepped out the flames were really high. The couple spent a few hours in the car park before going to Helen’s mother’s house for get rest of the morning. They returned to collect their belongings out of their room but their cars remain at the site. The latest picture of the charred ruin of the restaurant. According to he hotel manager, a total of 27 guests were staying last night in 22 rooms. There were no injuries. The fire service is using two hydraulic platforms. They are shooting strong jets of water on to the thatched roof. Big plumes of white smoke still rise from the destroyed roof. I’m told there are many heat pockets and it’s going to be a long job. Firefighters cannot enter the building as it is too dangerous at present. Meanwhile staff who were meant to be working are gathered outside the cordon. Locals are also coming up to see the fire operation take place.